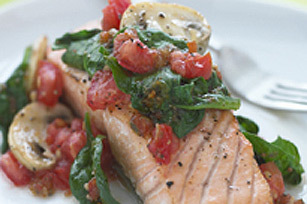 Try our bistro-style oven-baked salmon - made with spinach, mushrooms and tomatoes this simple salmon entrée is easy and delicious. Preheat oven to 375°F. Place salmon fillets, skin-sides down, in 13x9-inch baking dish sprayed with cooking spray. Bake 20 to 25 min. or until salmon flakes easily with fork. Prepare as directed, substituting red snapper or orange roughy fillets for the salmon fillets.